The weather was gorgeous, and the airport was full! 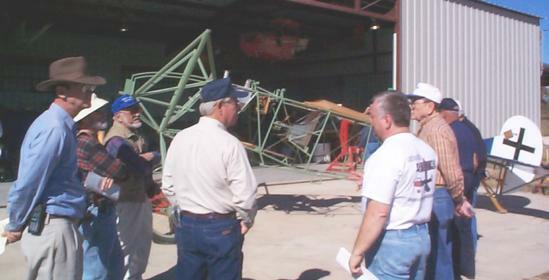 A beautiful fall day brought out around 60 airplanes to Old Kingsbury Aerodrome for the Vintage Aviation Historical Foundation's Fall Fly-in and Membership Meeting. Once again we saw a great mix of visiting aircraft, ranging from a Ryan PT-22 and a pre-war Fairchild 24 to the most modern homebuilts, with plenty of stuff in between. The crowd kept our concession stand busy, with lots of sausages, hamburgers, soft drinks and chips disappearing over the course of the day. The stand was ably manned by various PFM board members and volunteers. Special thanks go to Lt. Commander Chase Webb, Lieutenant Jimmy Moore, and Seaman Kelvin Marchant of the Smithson Valley High School NJROTC for helping out in the concessions area. We also had a full day of informative activities, centered around the various airplane projects. At 11:00, Bruce Robertson gave a presentation on World War I. Noon saw Vern Hatch bringing people up to date on the Canuck project. 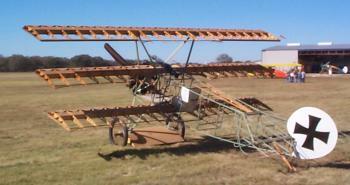 Bill Broussard explained the Fokker D.VII project at 1:00 PM, and the Fokker Dr.I at 2:00 PM. The highlight of the day came at 3:00 PM, when Debbie Winegarten gave our featured History Alive presentation. She told the story of Katherine Stinson, a pioneering woman flyer from the pre-WWI days of aviation. 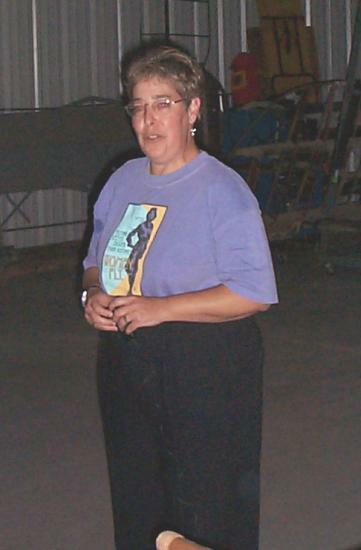 Katherine was the fourth woman in the US to get a pilot's license. She barnstormed the US in the years before the country entered World War I, inventing some aerobatic maneuvers still used by performers today. The rest of the family was quite air-minded, as well. Her sister Marjorie was an early airmail pilot, carrying an inaugural airmail pouch between Sequin and San Antonio. Her brother, Eddie, would later found the Stinson Aircraft Company. In 1915, Katherine and her siblings created an airport and started a flying school in San Antonio, Texas. This airport, Stinson Field, is still in existence. After a fascinating presentation, Ms. Winegarten answered questions and autographed copies of her book about Katherine. She is currently working on a book about the lives of all of the Stinsons.